Apparently PBS has decided to make like MSNBC and spend more time dissecting the Republican Party’s problems real, imagined, and/or overblown. On Monday’s PBS NewsHour, anchor Judy Woodruff announced that the program would begin “a series of conversations about where the Republican Party goes from here.” The first installment, a discussion with former Senate Majority Leader Trent Lott (R-Miss. ), amounted to a lot of hand-wringing over the Tea Party. Throughout the interview, Lott tried to keep the focus on positive steps Republicans can take, but Woodruff kept calling his attention back to the alleged problem of the Tea Party. The anchor reminded Lott that “you have factions in your party, I mean, all the way from the Tea Party to folks who sympathize with the Tea Party all the way to some moderates.” Interesting how she split the Tea Party into two groups while putting “some moderates” in one group. The Washington Post’s Karen Tumulty is trying to help the Republicans on the front page of Friday’s paper. It's not labeled "Analysis," but "Politics Debrief." The alliance between the “agreeable” GOP and the media is getting more transparent. There you have it, on your radio: Trent Lott in a Darth Vader suit. From his brother-in-law in jail, no less. The Los Angeles Times has been doing its best to dismiss Senator Harry Reid's racist remark about Preisdent Obama as a minor transgression while portraying Republicans calling for his resignation as political attack dogs. This coverage stands in stark contrast to the paper's coverage of the controversy surrounding former Republican Senate Majority Leader Trent Lott in 2002 (h/t Patterico). Contrast this Times story to the paper's own coverage of Trent Lott's remarks in 2002 and Democrats' calls for him to step down as Majority Leader. The Times portrayed the uproar over his remarks not as an attack, but rather as a spontaneous, impalpable furor. The uproar was a "spiraling controversy" or a "growing clamor." "Outrage Grows Over Lott Remarks" read one headline. 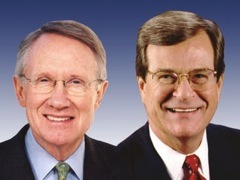 "Harry Reid is no Trent Lott," argues Newsweek's Ben Adler in a January 11 The Gaggle blog post by the same name. Of course, nowhere in his brief blog post does Adler acknowledge the media's role in why that double standard is in play. Media on Lott vs. Reid: A Trouble Standard? 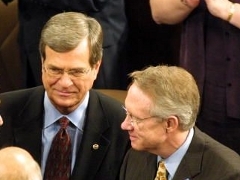 Sen. Harry Reid (D-Nev.) in 2002 agreed with former Sen. Trent Lott's (R-Miss.) decision to resign his leadership role after Lott made what some felt were racist remarks at former Sen. Strom Thurmond's 100th birthday party. "He had no alternative," said Reid at the time claiming, "If you tell ethnic jokes in the backroom, it's that much easier to say ethnic things publicly. I've always practiced how I play." As liberal media members work overtime to spin racist comments Reid made about presidential candidate Barack Obama in 2008, it's going to be very interesting to see how many recall Lott's resignation or what Reid said about the incident.